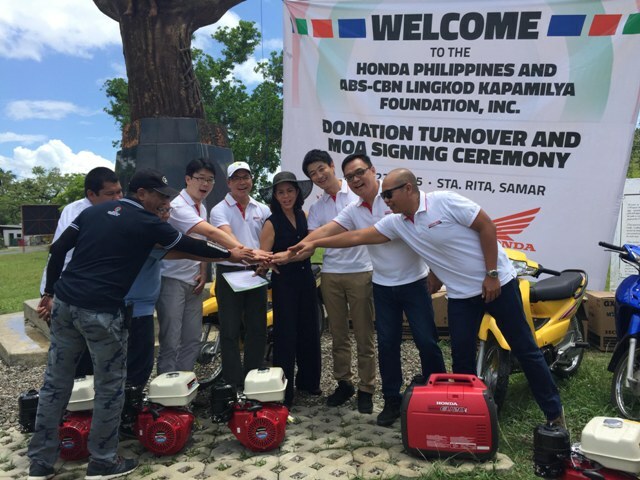 A long time donor of Bantay Kalikasan’s Bantay Baterya Project, Honda Philippines reaffirmed its commitment on April 22, 2015 by turning over eight boat engines, three motorcycles, one silent type generator and 20 road and site signage to benefit the people's organizations in ABS-CBN Lingkod Kapamilya Foundation, Inc. (ALKFI) managed ecotourism sites in Basey and Marabut in Samar. The municipalities of Basey and Marabut are two of four Yolanda areas assigned to ALKFI by OPARR (Office of the Presidential Assistant for Rehabilitation and Recovery), the office that monitors the rehabilitation efforts in areas affected by Typhoon Yolanda. The Honda boat engines will be used as passenger tour boats in Sohoton and Marabut, while the generator will be used to provide electricity at the Visitors Center at Sohoton Cave, enabling the beneficiary communities to have an alternative source of livelihood from ecotourism. Our benefactors were able to meet the beneficiaries during their site visit. Gracing the occasion from Honda were Masaki Hagiwara (Assistant Vice President, Power Product Sales), Masakazu Kawai (Adviser for Business Admin Division), Gene Paralisan (Assistant Vice President for External Corporate Affairs), Raymond Cristobal, (Manager for Power Products), Stephanie Kinkito (Manager for Corporate Social Responsibility). Atty. Rey Delgado (BK – Samar Area Manager) and Gina Lopez (ALKFI Chairman) accepted the donation on behalf of ABS-CBN Lingkod Kapamilya Foundation.